Dell has built a new high-speed server designed for workhorse applications such as enterprise resource planning, e-commerce and databases. 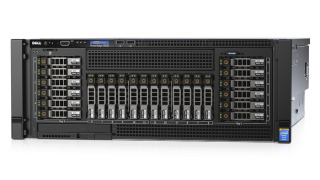 The PowerEdge R920 it is Dells first to use Intel's new E7 processors. According to Dell, the PowerEdge R920 is a 4-socket 4U server that claims to deliver the same performance as the previous generation 8-socket server but with some interesting technology under the bonnet. The R920 has 8 PCIe Express Flash drives, a H730P PowerEdge RAID controller that doubles cache size and the ability to maximize performance based on the available solid-state drives. The server has up to 6 TB of memory and up to 24 local storage drives. Dell is claiming many world records for processing times. It managed a world record 4-socket Linux benchmark result of 24,150 benchmark users on the SAP SD 2-Tier benchmark and a 71 per cent improved performance over the previous best E7-4800 4-socket SAP SD benchmark. On Oracle workloads, the server could process more than twice the number of Oracle OLAP queries than with previous generation server configurations. The system depends on running up to 60 cores of processing power and using things like eight high performance, ultra-low latency PCIe Express Flash drives. The server also uses the new H730P PowerEdge RAID controller (PERC) that Dell claims doubles the previous cache size and delivers up to 100 per cent more IOPS performance, and the dual PERC capacity that lets customers maximize performance across the larger number of available solid state drives (SSDs).